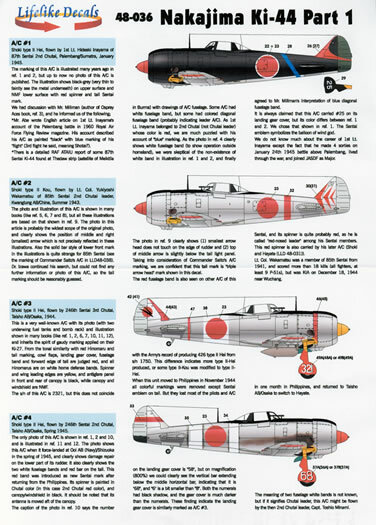 Decals for 4 subjects with colour-printed painting and markings guide. Excellent quality and attractive subject choice. This is very nice sheet from Lifelike Decals. It is always great to see new decals from the Japanese company Lifelike decals. Apart from being first rate decals, the subjects they choose to represent in decal form are out of the ordinary. Their latest batch of releases is for the Nakajima Ki-44 Sh?ki (Demon) or “Tojo, the name given to it by the Allied Technical Air Intelligence Unit under their reporting system in World War Two. Type II Hei, flown by a 1st Lieutenant Hideaki Inayama of the 87th Sentai 2nd Chutai at Palembang in Sumatra in January of 1945. The camouflage scheme is described as being in a very thin coat of black-grey paint, so thin to faintly show the bare metal beneath it. Its rudder is medium green and it sports the squadrons’ stylised markings on the tail in red as well as a blue band around the rear fuselage (supplied as a decal). There is much more of a description of the markings for this and every other option carried on the placement guide that comes with the decal sheet. Type II Kou, flown by Lieutenant Colonel Yukiyoshi Wakamatsu the 2nd Chutai leader of the 85th Sentai whilst based at Kwangtung Air Base, China in the summer of 1943. It is in overall natural metal finish with a red spinner, fuselage band (supplied as a decal) and squadron tail marking. The leading edges of the wings are in yellow as are all of the options on the sheet and these are supplied as multi-part decals. Type II Hei, of the 3rd Chutai, 246th Sentai, at Taisho Air Base, Osaka in 1944. In overall natural metal finish with a yellow spinner, a thin red band around the rear fuselage, red undercarriage doors (which are supplied as a decal or with just the number alone to allow you to paint the doors) and leading edge to the vertical stabiliser. It also sports the wide white home defence bands around its wings and fuselage. Type II Hei, belonging to the 2nd Chutai of the 246th Sentai at the Taisho Air Base Osaka in the spring of 1945. In overall natural metal finish with a red chord-wise band around its vertical stabiliser and rudder (supplied as a decal). It also wears a red spinner and two wide white bands around its fuselage (supplied as decals) and red undercarriage covers (again, you get the option of using a decal or of painting them yourself and applying the numbers). The decals themselves have been printed by Cartograf. They seem to be very glossy and have a minimum of carrier film surrounding each subject. Two sets of (minimal) stencil data is provided as are two separate sets of hinomarus which will enable you to realise two separate models from the sheet should you paint the wings yellow leading edges on your second model. 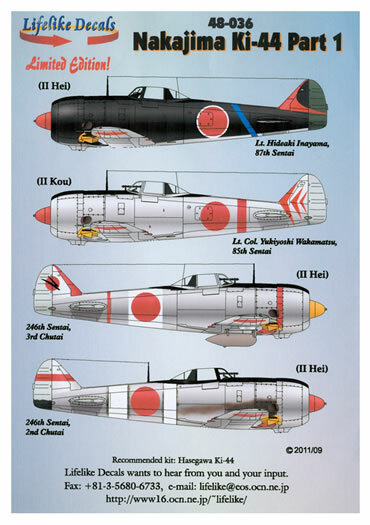 The Hasegawa Ki-44 is the recommended kit. The placement guide comes in the form of two A-4 sized sheets of heavy-weight paper. Left hand side profiles are provided for each option as well as (smaller upper and lower plan surface views. As mentioned above, very comprehensive notes are provided for each option and why a particular marking was chosen over another is carefully explained when there is doubt between the various references used in realising the sheet. The placement guides and the decal sheet come packed in a clear plastic zip-loc bag. 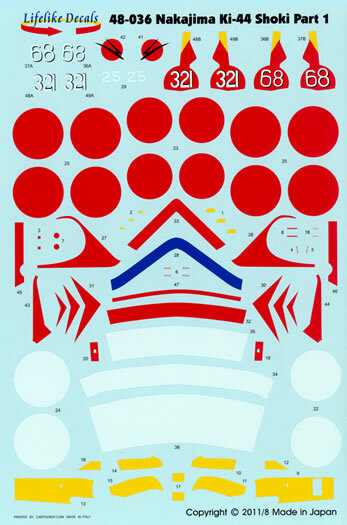 This is an excellent sheet from Lifelike Decal. 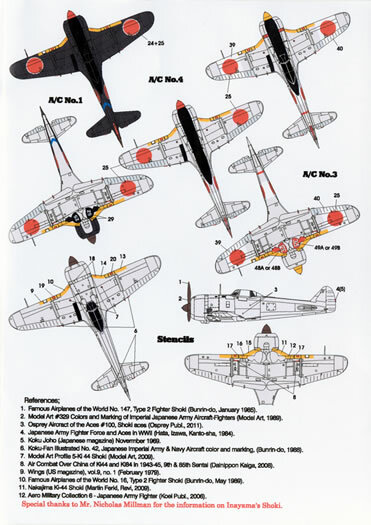 It provides you with first rate decals and excellent research for some unusual Ki-44 options.